Exciting news! My new play The Last Song of Oliver Sipple will be part of the Playmill festival at the King’s Head in London on July 13 and 14. Tickets on sale now! My short play #unfriended will be part of The Scene at the Tabard Theatre in London on April 14. Tickets here! Some scenes from my new play The Funeral will be performed as part of A Tiny Scratch at the King’s Head on January 28. Details here! Did a reading of a new version of my play Eyes to the Wind. I spent a day doing R&D on my new play The Funeral with Tiny Theatre Company. My play Skin(ny) will be part of a night of new writing at Southwark Playhouse on November 4, produced by Full Disclosure. Details here! My short play Chekhovian received a rehearsed reading by Manchester ADP theatre. My short play Red or Blue? will be part of BIG NIGHT OUT, an evening of plays at the Edinburgh festival fringe curated by Itch + Scratch. Details here. My short play Chekhovian has been selected for a new writing night in March 2019. Details here! One of my short plays will be part of a show at this year's Edinburgh festival fringe on August 4. It will be previewed on August 2 in London. Details here and more to follow! A new production of Banana Crabtree Simon will be staged at Theatre503 in London on July 12 and 14 as part of the Mountview Catalyst Festival. Details here. I have been interviewed by worldsnooker.com here. I spent a day workshopping my play A Question of Consent at the Pleasance Theatre in London. My short play Do Something! was part of a night of new writing at the Etcetera Theatre in London. On the Night is produced by Falling Pennies. 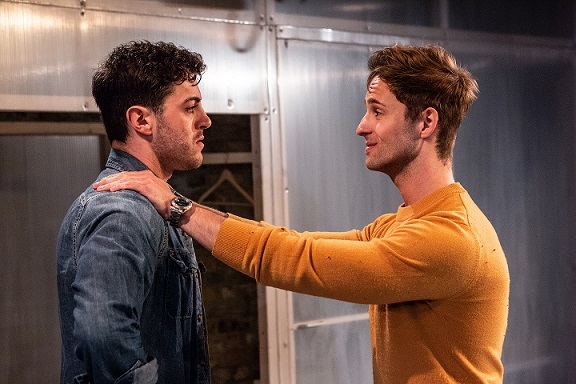 A new section of Eyes to the Wind, runner-up in the Kenneth Branagh new writing award 2016, was performed at the Arcola Theatre in London as part of Bites and Scratches, an evening of new work produced by Fine Mess Theatre. richard henderson and samuel curry perform in eyes to the wind at the arcola in londo n (photo: ali wright). Exciting news that Banana, Crabtree, Simon has been nominated for two Off West End 'OFFIE' awards: Best Actor for CJ De Mooi and Best New Play for myself. Congratulations to the whole BCS team! An enjoyable day was spent workshopping A Question of Consent with Fabricate Theatre. I have been interviewed by Danny Stack and Tim Clague about my playwriting adventures on their UK Scriptwriters' podcast! Listen here.